Diminish wrinkles inside and out! IMPROVE SKIN ELASTICITY THROUGH "IN-SIDE” SKIN CARE - With Bulgarian Rose Oil, you can effectively refresh "In-side skin care." Botanical ingredients extracted from Bulgarian Rose oil deeply penetrates into your skin to increase elasticity and form a protective barrier on the skin. Above all, Pleurotus cystidiosus ferment filtrate contains a highly concentrated natural antioxidant. It penetrates deep into the skin, and it will take effect immediately. PROTECT YOUR SKIN THROUGH "OUT-SIDE” SKIN CARE - Our natural vegetable oil is supplied densely for every surface of each wrinkle. Especially, our patented ingredient Naturo JC has a tightening effect on the skin. It primarily forms a very fine moisturizing surface on the epidermis to help protect skin and minimize the development of wrinkles and surface roughness. All you need to do is gently dab a small amount around the wrinkled area. 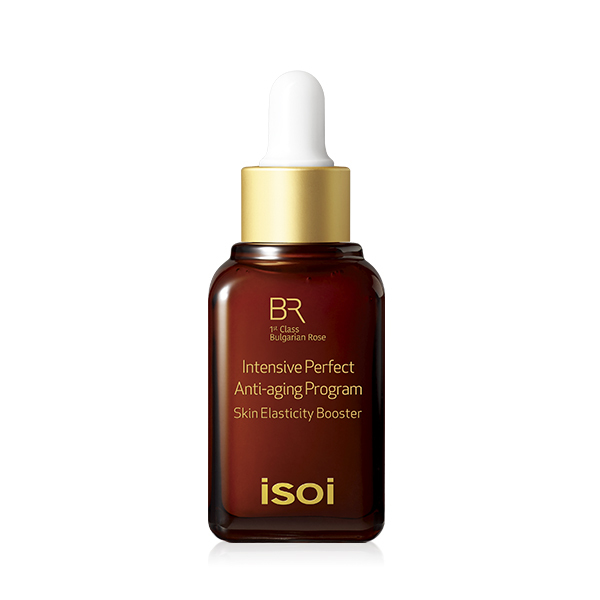 LONG-LASTING EFFECT OF VITAMIN-RICH NATURAL INGREDIENTS - isoi Bulgarian Intensive Perfect Anti-aging Program demonstrates nature's vegetable effects, leaving you with glowing and radiant skin. We are using more than 12 guaranteed natural extracts. Particularly, Paeonia Suffruticosa (Moutan) Root Extract is well-known as a substitute chemical composition in cosmetics that prevents aging and regenerates your skin. CERTIFICATION & TRUSTED RESOURCES - Our ampoule is nominated by 2015 The Most Asia Beauty Awards, and we were selected as the Best Anti-Aging Program. We believe that isoi's unique blending technique is derived from advanced research. Pleurotus built a research lab in Germany. Based on the heart of natural cosmetics technology, we keep struggling to develop an excellent quality of natural skincare products. Thanks to our passion, we officially accredited by EWG VERIFIED & DERMATEST. EXPERIENCE STEP-BY-STEP GUIDE WITH SCIENTIFICALLY-PROVEN SKIN CARE - If you want to manage your skin comprehensively, isoi recommends that you use either Intensive Basic Care or Intensive Special Care. By experiencing isoi's systematic step-by-step skin care, you will be able to improve skin moisturizing, whitening and nutritional balance. You can safely use our lineup since it is based on proven data obtained from the accumulation of knowledge over the years. Use tonic prior to application. Shake the Bulgarian Rose Intensive Perfect Anti-Aging Program well before use. Use 2-3 drops and apply evenly to the face for full absorption.